The Alpinestars Atem family of gear leads with a new level of comfort and protection. Are you ready? Can you feel the tension? 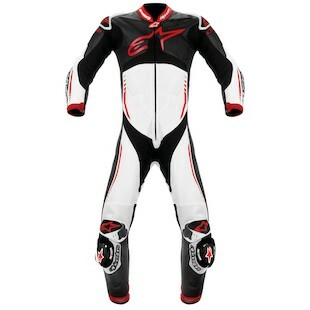 The Alpinestars Atem Race Suit cometh! We predict it will hit hard and replace the Tech 1R as the second most technical suit in the entire Astars line. It's made of 1.3MM full grain leather for high performance, impact and abrasion resistance. New elements showcase Alpinestar exclusive DFS (dynamic friction shield) technology: hard polyurethane protectors over the knees, shoulders, elbows and tibia. An Aramidic stretch panel has been added to the chest and the entire suit is now CE certified (not just the armor). Other new features include a Velcro adjustment at the wrist and ankles, and the addition of spring loaded zippers. Aside from these new features, this race suit showcases many of the technical innovations as tested by MotoGP racers. The Atem delivers exceptional levels of safety, comfort and weather protection that maximize quality and performance. 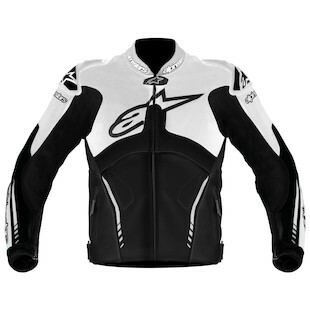 The Alpinestars Atem is identical in style and features to the Atem racing suit -- it's just the track ready version in jacket form. With the same new enhancements as the full suit, the Atem jacket falls in as the upgraded version of the Tech IR jacket. The Atem jacket is 1.33MM full grain leather, has DFS armor shoulder and elbow protectors, full sleeve Aramidic stretch panels, 3D Tech mesh wrist and neoprene collar to prevent skin chafing. This garment is also CE certified with removable security straps to maintain the jacket position in case of a feet first slide. The 3D Tech mesh liner increases comfort and ventilation by creating a space between the liner and leather, allowing for better air flow.